Designed for the beginner, this illustrated guide to carpentry gives advice on techniques and finishing touches that make the difference between rough, amateurish results and a professional finish. The book covers mouldings, wainscoting and wood flooring, cornice construction, roofing and siding. 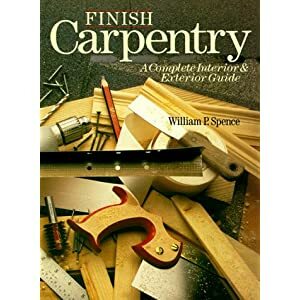 Finish carpentry involves the installation of the wooden features that will become important to the decorative appearance of the interior or exterior of a building. See how to select moldings, and install and trim doors and windows. Work with paneling, wainscoting, and gypsum wall board, and various types of wood flooring. Finish stairs and install cabinets. For the exterior, learn the basics of cornice construction, roofing, and siding. 288 pages, 643 b/w illus., 8 1/4 x 11.